Florida Beach House with Private Pool! 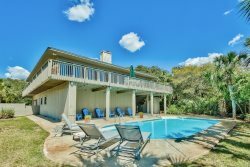 Easy Walk to Beach, Soak Up The Sun in South Walton!Get the family together in this quintessential Florida beach house along Hwy 30A. Florida Beach House with Private Pool! Easy Walk to Beach, Soak Up The Sun in South Walton! Take your vacation back to the way you remember family beach days in this classic beach house nestled in Dune Allen on the west end of Scenic Highway 30-A. This Florida-style 3-bedroom, 2-bath home offers details of traditional comforts of a beach vacation – with all of the modern updates you’ve come to love when vacationing. Spend your day enjoying the home’s private pool or at the beach (the Stallworth Beach Access is just across the street). Tucked away in a small, quiet neighborhood shaded by oaks and palms you’ll love this beach escape! Listen to the gulf waves and feel the beach breezes while lounging on the wrap-around deck or sunning on the spacious patios. Enter your beach house through its courtyard where stairs lead to the home’s second floor, the main living area, which is beautifully and comfortably updated. The kitchen, dining and living areas offer a perfect space for your guests to gather or just relax. It’s loaded with natural light and coastal charm. The kitchen has Quartz countertops and updated stainless steel appliances plus two refrigerators (one for drinks, one for treats!). An over-sized breakfast bar seats six to make any mealtime easy. The dining room seats six guests as well. The master bedroom is very spacious and offers a king-size bed, TV and large closet. Its en suite bathroom has a double vanity, soaking tub and separate standing shower. It has sliding doors out to an incredibly spacious Florida room that runs the length of the entire home. The first guest room has a set of double beds and large closet. The second guest bedroom has two sets of bunks each with a full-size bottom mattress and twin size top mattress. Both guest bedrooms share the hall bathroom which has a single vanity and shower/tub combo. Relax in the huge Florida room - perfect for family game night or quiet morning solitude. Catch a little Florida sunshine on the home’s adjacent uncovered wrap-around deck. Enjoy the grassy yard areas with privacy fencing and perfect for the kids. Outdoor showers are convenient to cool off after the beach. After time between the beach and pool, enjoy access to some incredible amenities like family owned restaurants and the 30-A bike path. Nearby Stinky’s Restaurant is a local favorite and you can bike there! Looking for something a little more active? Minutes from your doorstep is the Topsail Hill Preserve State Park where trails, outdoor programs and an additional beach access await. Head about 10 minutes east to Gulf Place where seasonal outdoor activities, music and great restaurants are always waiting. Take a step back to a beach vacation the way you remember with easy going beach days, pool games, bike rides, and evenings spent with family and friends.